What Price Ranges Are Hot in SW Florida Real Estate? 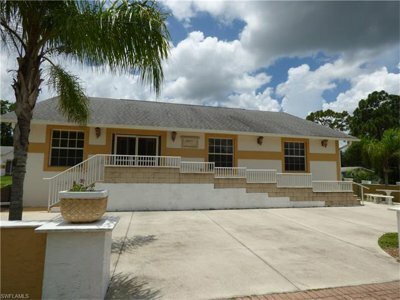 Home » What Price Ranges Are Hot in SW Florida Real Estate? 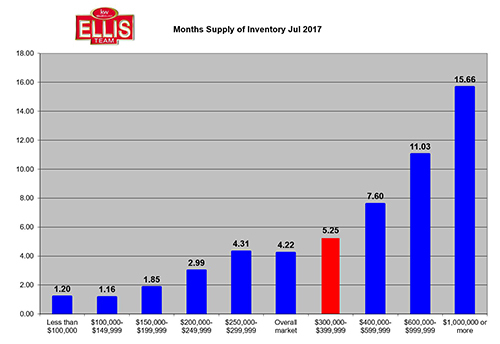 While pulling data for the latest monthly supply of inventory we noticed some increases in buying activity in certain price ranges. Today we thought we’d bring you the latest monthly supply numbers and answer what price ranges are hot in SW Florida real estate market. The overall months’ supply of homes on the market today stands at 4.2 months. 5.5 months’ supply is considered a balanced market, so overall, we’re in a seller’s market. However, as we all know, there are segments in the market and supply changes by price range. Obviously by looking at the chart, anything $250k or under is the sweet spot for this market. However, anything up to $400k isn’t too bad either. So where did we see a pickup in home sales since we last published this report? We saw a nice gain in sales in the $200-250 range. For the past 365 days there were 2,177 sales compared to a rolling 365 day count back in April of 2,059. That’s a pickup of 118 sales in a 3-month period. The overall market saw a pickup of just 6 homes. There were almost 19,000 home sales in the last 365 days, so 6 homes is almost dead-even. The $300-$399k range saw a pickup of 87 homes, and the $400-$599k range saw a pickup of 86 homes. So, if the overall market only picked up 6 homes, there had to be some drops. The $100-$149k range saw the largest drop of 160 homes followed by the $100k or less of 108 homes. Now, this isn’t necessarily a bad thing. It means these homes graduated to higher prices and there were fewer homes available in those ranges. The market didn’t suffer because as those homes graduated, we saw an increase in home sales into the prices ranges they graduated into. What does all this tell us? It tells us the market is segmented and you have to know your numbers. Pricing is still important as to how aggressive you choose to be. When you’re stretching it, you must market the home well, and be prepared to adjust if the market doesn’t respond. Nationally, homes sales slipped month over month. Interest rates are creeping up. Rents are high in Southwest Florida which motivates buyers to purchase, however rising rates crimp their ability to pay. We love a seller’s market that is close to balanced. There are winners and losers in every transaction. Many times, there are two winners, the buyer and seller. The loser is the buyer who missed out because they weren’t ready. Getting pre-approved before you offer helps so much, especially in a multi-offer situation. Having an experienced agent who can help make your offer look the best to the seller helps too. Remember this. The buyer and seller are not in competition with each other. Buyers are in competition with all the other buyers out there competing for the same supply of homes. The sellers are in competition with all the other sellers out there for the interested buyers. When you find a home you like, don’t screw it up. Go get it. Sellers, when you find a buyer that works, don’t screw it up either. The best homes go fast, and the best buyers go fast. You must ask yourself, am I willing to lose this transaction, because the next may not be as appealing to me as this one? It takes a strong real estate professional who knows the market and knows the numbers to properly help you make that decision. If you’re thinking of buying, selling, or both, always call the Ellis Team at Keller Williams Realty. We’ve been doing this awhile, and we’ve seen a few things. We can help make the difference for you! Feel free to search the MLS, or find out what your homes is worth online for free at www.LeeCountyOnline.com Or call us at 239-489-4042 We’re glad to help! 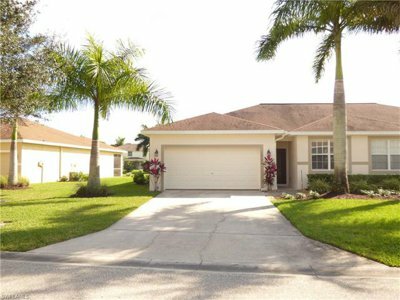 Posted in Cape Coral, Cape Coral Real Estate, Fort Myers, Fort Myers Real Estate, Gated Community, Open House, Southwest Florida Real Estate.Tagged Best real estate team in SW Florida, Daniels Park, month's supply of inventory, News Press readers poll, SW Florida real estate market, What Price Ranges are Hot.